A federal court could rule soon whether the removal of a student's painting from the U.S. Capitol violated the artist's First Amendment rights. Scott MacFarlane reports. A federal court could rule soon whether the removal of a student's painting from the U.S. Capitol violated the artist's First Amendment rights. Outside art experts and the speaker of the U.S. House of Representatives were part of deliberations into the removal of the high school student's controversial painting from U.S. Capitol grounds in January, according to court filings. 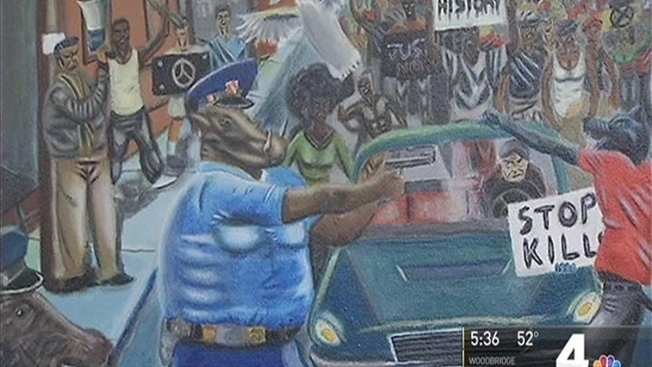 The filings were part of more than 100 pages of documents provided by the architect of the Capitol to justify his decision to remove "Untitled #1," an acrylic painting depicting police officers as animals brandishing firearms. The architect of the Capitol, who oversees the high school art competition in which the painting was submitted, ended the dispute by ruling the painting formally removed. His decision sparked a federal lawsuit by Clay and the student painter against the Office of the Architect of the Capitol. In court filings defending his decision, Architect of the Capitol Stephen Ayers reveals he "informally conferred" with an acting provost of the Smithsonian Institution and the director of the American Folk Art Museum before determining the painting failed to comply with guidelines for the high school art competition. "The architect and these experts came to the consensus that 'Untitled #1' did not meet the competition's suitability guidelines," Ayers said in his filings. Ayers argued paintings chosen as winners in the congressional high school art competition do not enjoy full First Amendment free speech rights. "On the contrary, the art display on government walls on a tunnel between the Capitol and the House Office Building constitutes government speech," he said. "The fact that this display was created through a Congressional Art Competition involving private parties -- a competition which the government designed, sponsored and controlled -- does not alter this conclusion." The I-Team's review of court records shows U.S. House administrators last removed a high school art competition work in 1989. In that case, the art piece chosen by a Cleveland-area member of the U.S. House was later found to have been a copy of a professional photograph featured in an April 1989 issue of Vogue magazine.